2835 SMD LED is 40% brighter than the 3528 SMD LED and has a up to 100 lumens per watt lumen output. The dimmable SMD 2835 LED Flex Strip is available in Neural white (4000 to 4200K) CRI 80 and Warm White (2900 to 3100K) CRI 80+. 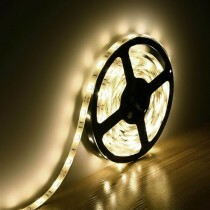 The low voltage (12VDC) LED strip can be cut at marked intervals (3 LED cutting points) and comes in 5 meter (16.4 feet) roll. It is suitable for dry locations and has a 3M tape backing for easy installation. The LED Strip can be easily mounted into LED World’s Aluminium Channel profiles. All of our Flex Strips come with 12″ (30.5cm) lead wires to be powered with our Class 2 power supply. UL Recognized, UL Listed, and ETL Listed White LED Strip Lights in water-resistant, non water-resistant and waterproof strip light varieties. Perfect for any interior or exterior LED lighting projects. A cool white tone makes this light perfect for any indoor, outdoor, or industrial strip lighting project requiring energy saving, low power LED Strip Lights. UL Listed, RoHS and CE approved. 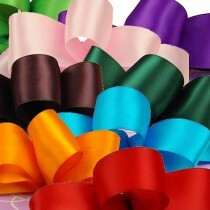 Solid Color Premium Fabric Satin RibbonWe have tested many ribbons and have carefully selected this ..